Our Jar Full Of Bundt Cakes are just to cute!! You get 16 wax bundt cakes per order. 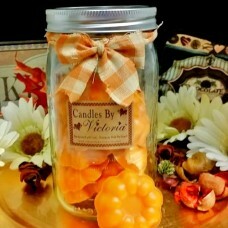 Packaged in a quart mason jar and tied off with a piece of home spun, these adorable tarts are sure to be a hit. Pop one of these little wax bundt cakes in your tart warmer then sit back and enjoy the wonderful aroma as it fills your room. Great gift idea!! Available in all our wonderful fragrances!